Changed a exception handler of djUnit class loader. [Fixed bug] Mojibake of djUnit class loader message. [Fixed bug] SWT's "no more handles" occurs. [Fixed bug] Coverage target line(finally clause) bug with asm1.5.x. 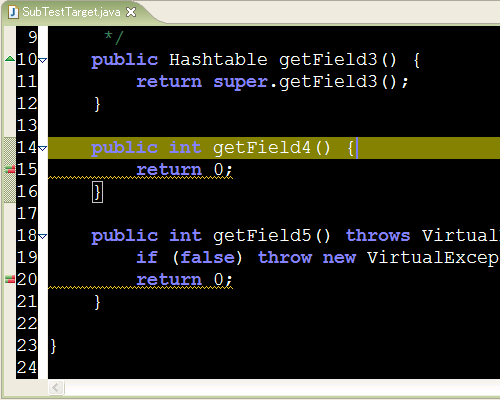 Enabled a coverage and test with VMO for Enum class. new parameter "HTML Report Charset" was added into project settings. [Fixed bug] When using the ASM library, The class name argument (for addReturnValue method, etc.) is different to a BCEL's. [Fixed bug] Can not set an exception to interface's method(ex. PreparedStatement#close). djUnit plugin is JUnit TestRunner with the custom classloader. djUnit ClassLoader modifies class in loading to JVM, and runs tests using the modified class. The following functions can now be used easily. djUnit can perform tests of JUnit, and useage is easy(same as JUnit). djUnit uses jcoverage to generate a coverage report of the performed tests, and it can be checked on Eclipse. 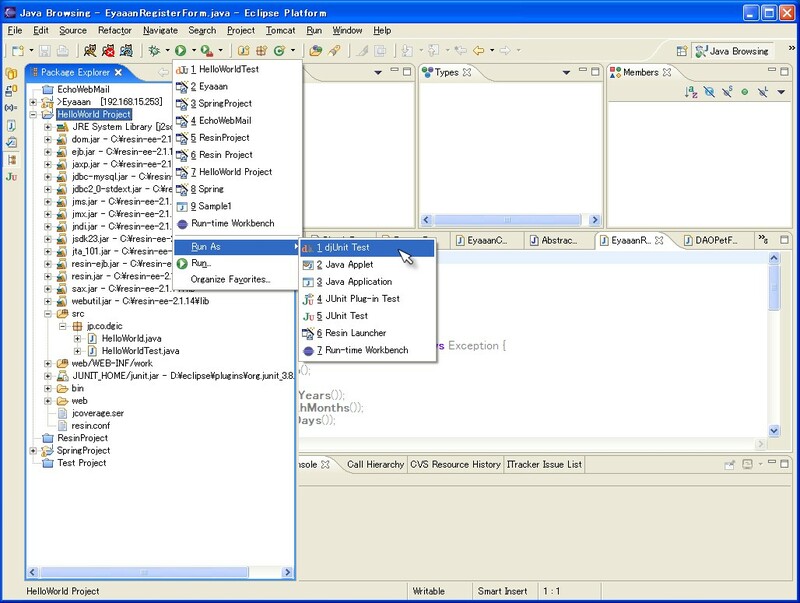 The results are shown on djUnit coverage view , task list and java source editor. The following is a Virtual Mock Objects reference site. "Virtual Mock Objects using AspectJ with JUNIT"
djUnit uses ASM and BCEL, and has an added original extension. 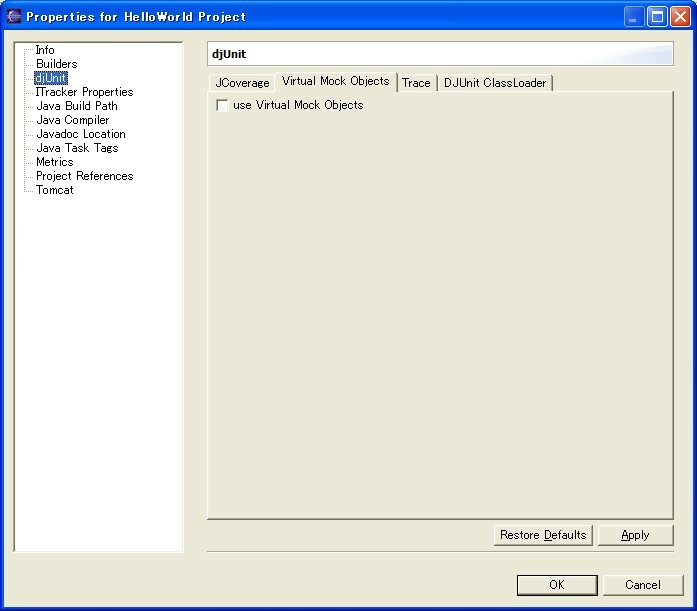 If Virtual Mock Objects is used, it enables creation of Mock Object at low cost, and it can also write simple tests. Please access download page from the link below. When djUnit of an old version(0.8.1 or older) is in eclipse plugins directory, delete old version. When djUnit of an old version is in eclipse plugins directory, delete old version. Unpack the zip file into your eclipse plugins directory. Select TestCase class in Package Explorer. We are greatly thankful to the people who post wonderful tools and information. Please send us comments, an opinions, or to report a bug, etc.